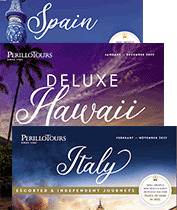 Perillo Tours always provide ample opportunity to explore the wonderful shops of Hawaii. Your knowledgeable tour guide can help you find the best values and variety. Oahu has the most shopping choices of all the islands. Waikiki is well known for its world class shops – you’ll find everything from Gucci and Tiffany and Co. to unusual local stores and unique handicrafts. The Ala Moana Shopping Center, Hawaii's largest mall, has more than 200 restaurants and shops, including Neiman Marcus, Macy's, Sears and J.C.Penny. Right across the street from our hotel, the famous International Marketplace offers bargains on souvenirs and craft items, and down the street is the Royal Hawaiian Shopping Center, housing 160 shops, including Fendi, Chanel, Ferragamo and Hermes. In downtown Honolulu is the largest Hilo Hattie in the islands. It’s a fun place to visit – they carry the largest selection of "Aloha wear" you’ll find anywhere. Aloha shirts, floral print dresses, t-shirts, souvenirs and all kinds of Hawaiian products, including macadamia nuts and other packaged food items. They even have seamstresses on hand, in case you need that special muu muu altered! Honolulu's Chinatown District, historically the oldest Chinatown in the country, is filled with exotic Asian shops, and Maui Divers Jewelry carries beautiful, locally made jewelry. For excellent quality, this is a great place to buy Hawaiian jewelry, especially coral pieces. Down the block from Chinatown on Honolulu Harbor is the Aloha Tower Market Place, famous for the Aloha Tower and now for some fabulous stores and restaurants. Kauai, on the other hand, is known more for its beauty and resistance to change than for shopping. Nevertheless, there are many fun and interesting places to browse and buy. The Poipu Shopping Village has about 30 great little shops and restaurants, and in downtown Lihue you can find anything that you might need. Although Maui is more laid back than Oahu, there are plenty of shopping opportunities. The Whalers Village Shopping Center is Maui's only oceanfront shopping center. A number of shops and restaurants surround the Whalers Village Museum, too – and be sure to check out the museum! Another must-see on Maui is the town of Lahaina, the first capital of the Kingdom of Hawaii as well as one of the most important whaling towns in the world. Front Street has many specialty shops, art galleries, restaurants and popular night spots. If you opt to take Perillo's trip extension to the Big Island of Hawaii, check out King's Shops. It has more than 35 specialty shops and restaurants. Tour buses usually take rest stops, and many places have opportunities for some local souvenir shopping. Ask your Perillo tour guide where to buy certain things, especially jewelry and high-priced souvenirs. If you want to be assured of good quality, your tour guide can help you find reliable shops and merchants.